Shopping for residential in-ground flag poles? We carry a variety of in-ground flag poles in both aluminum flag poles and fiberflag flagpole . These poles can come in one piece or as sectional poles. The sectional poles are about 20’ high and the one piece poles are available in 5’ increments from 15’ up to 100’. 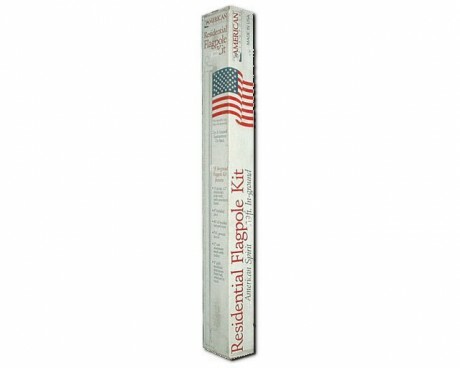 The most popular flagpoles are our aluminum in-ground flagpoles that are 20 feet exposed height. 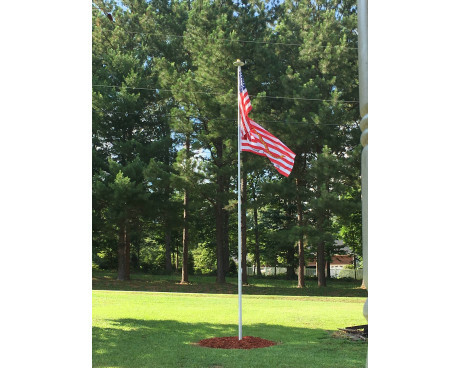 Our aluminum flag poles come in a light weight and a medium weight. A sectional flagpole or telescoping flag pole is typically light weight. Sectional poles can be removed for safe keeping or repair, stored, and reinstalled from the ground. 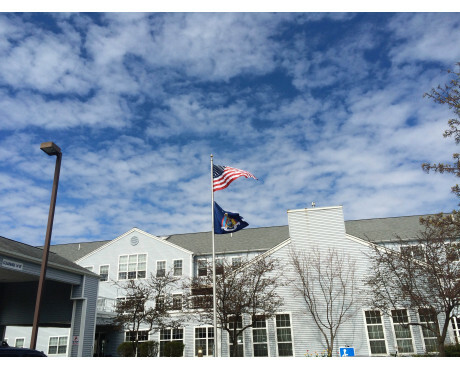 A sectional flagpole will withstand wind up to 40/45 mph. 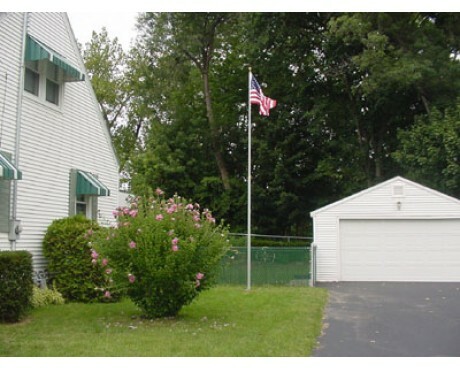 A sectional flagpole is usually just fine for residential application, as it is easy to put up and easy to maintain. The sectional poles can either come as a telescoping flagpole, or a pole with 5 separate pieces that are attached together. The telescoping flagpole is heavier than the sectional poles, and is also easily removed for storage and / or repair. Telescoping flagpoles can withstand winds up to about 70 mph. The medium weight flagpole is typically a single piece flagpole, and usually is not removed without a lift of some sort, and can withstand wind typically up to 90 mph. 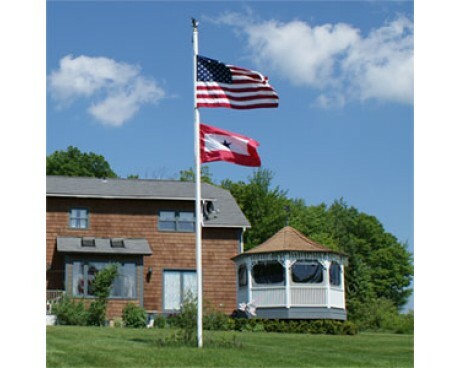 The aluminum flagpole is rust free and can come in an number of finishes, including anodized, powder coat, or the standard satin finish, which is a "brushed" finish. Our residential fiberglass flagpoles are also popular because they also do not rust, and have the added benefit of not being an electrical conductor. However, if the flagpole is wet, electricity (lightning) will conduct along the wet surface. Fiberglass flagpoles are typically single piece poles for residential installations. Standard colors for fiberglass flagpoles are white, black and gray. 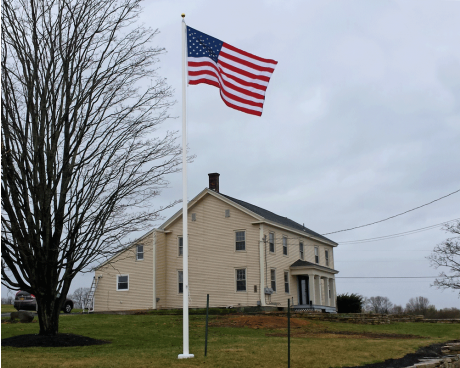 Fiberglass flagpoles can be ordered in any custom color for an additional fee. This is possible because the final top layer of gel coat can be colored to any color. Some fiberglass flagpoles are "painted" and can also be custom colored. 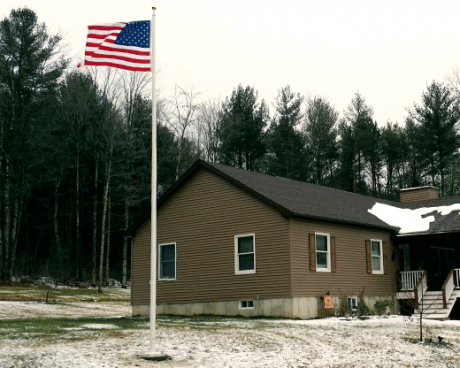 If you are purchasing a residential in-ground flag pole, you should also consider the manner in which you will light it. We offer a nice variety of flag pole lights and in particular with solar options. 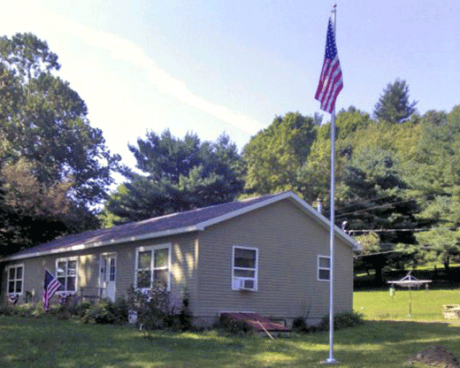 Shop In-Ground Residential Flagpoles Today! 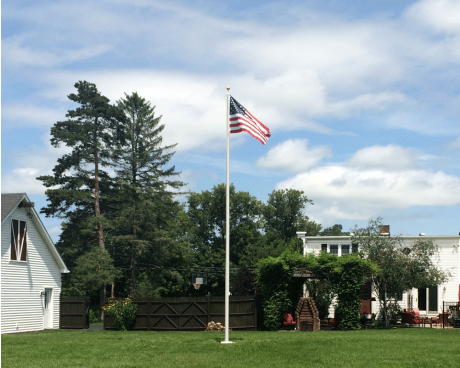 Have questions about any of our residential inground flagpoles for sale? Contact us today to learn more about these one piece and sectional poles and find out which one will fit best with your unique needs.